Kristin M. Capalbo - Dughi, Hewit & Domalewski, P.C. Kristin M. Capalbo joined the firm in 2008 and was named a partner in 2016. Ms. Capalbo limits her practice exclusively to all aspects of family law and divorce, including custody, parenting time, alimony, child support and payment of college expenses, equitable distribution of assets and liabilities, adoption, premarital agreements, and relocation out of the State of New Jersey. Ms. Capalbo also represents individuals involved in domestic violence disputes, both those seeking to obtain a restraining order, and those defending against one. Ms. Capalbo also works as a Mediator to assist both parties in reaching an amicable settlement agreement. Prior to joining the firm, Ms. Capalbo was an associate in the Family Law Department at Wilentz, Goldman & Spitzer, P.A. in Woodbridge, New Jersey. Ms. Capalbo has been appointed as a Guardian ad Litem by the Superior Court of New Jersey, and she has appeared before Judges in counties throughout the state. 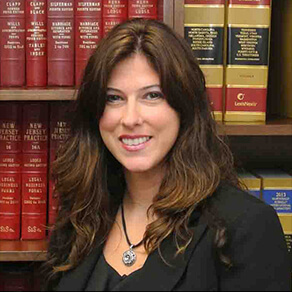 Ms. Capalbo serves as a Panelist on the Union County Matrimonial Early Settlement Panel and has completed 40 hours of mediation training provided by the Family Law Section, Justice Garibaldi ADR Inn of Court and New Jersey Institute for Continuing Legal Education. Ms. Capalbo received her juris doctor from Seton Hall University School of Law, where she participated in the Center for Social Justice Family Law Clinic and was elected Treasurer of the Public Interest Network. As a member of the Seton Hall Legislative Journal, she worked as a legal intern for Governor Jon S. Corzine when he was a United States Senator, where she assisted constituents with regard to international adoptions. Ms. Capalbo also worked as a research assistant for her Constitutional Law Professor, Mark Alexander, who is now the Dean of Villanova University Charles Widger School of Law. Ms. Capalbo is a member of the Family Law Sections of the New Jersey State Bar Association and the Union County Bar Association. In 2014, Ms. Capalbo won the Avvo Clients’ Choice Award. In 2016, Ms. Capalbo wrote a five part blog series on various divorce topics for Society of Grownups, a MassMutual Learning Initiative. 6/19/2016 – What Are You Actually Deciding When You Plan to Get a Divorce? 7/21/2016 – I’ve Decided to Get a Divorce. What Will it Cost? 8/18/2016 – How Will My Finances Change After I Get Divorced? 10/20/2016 – Is a Pre-Nup Right for You?